I have to admit I sometimes struggle with breakfast. Not really about what to make or what to do – I have so many ideas. Because when it comes to breakfast, I like variety to get even more excited about breakfasts and I just can’t make up my mind! One amazing option to start the day is my Breakfast Bowl [vegan, gluten free]. It’s my to go and will always be my kind of jam for any breakfast. If you haven’t tried it yet, you should. You have to know I’m a guy who could eat pizza and all the savory dishes for breakfast. Who’s with me? So it is not really a surprise that I came up with this Vegan Breakfast Burrito, which reflects this love mile high. 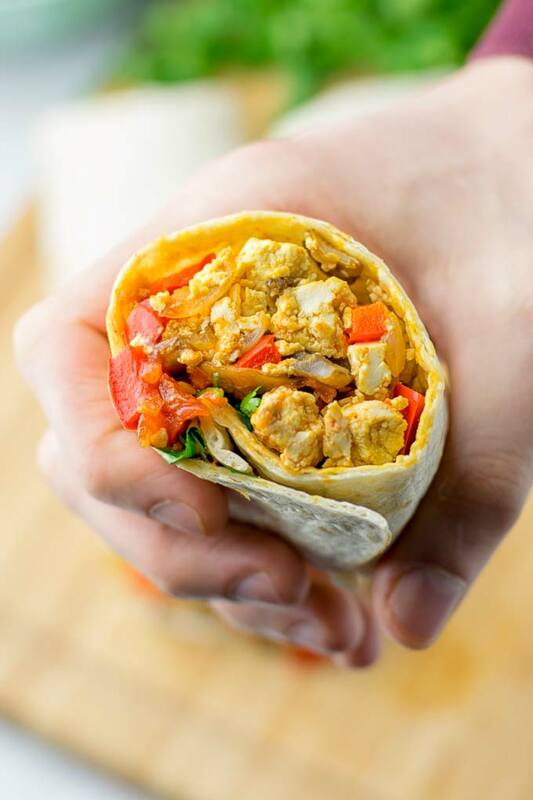 Trust me guys, if you try this you won’t make any other breakfast burrito recipe. 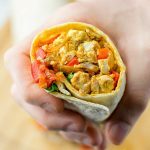 It’s seriously the best: hearty, savory, super satisfying, filling, really easy to make, egg like texture and taste without any eggs – so close to the real deal. Packed with amazing flavors in and out, protein rich and just the best thing to start any day with. Usually a breakfast burrito isn’t plant based or dairy free. It’s often made with cheese, sausage, and eggs. 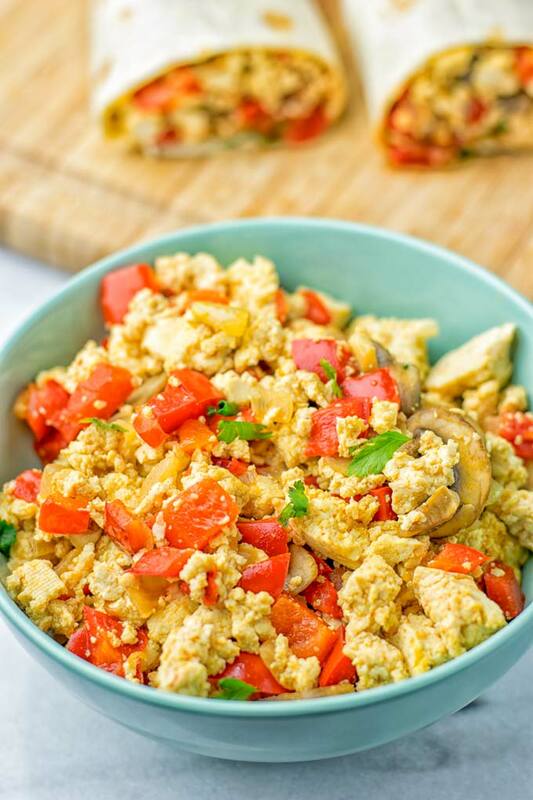 I do something different and use tofu which has a naturally scrambled egg-like texture. Also to come really to the real taste, I added ground kala namak, which is a type of rock salt and often described as black salt. Kala namak adds the typical egg flavor. The combo of tofu and kala namak is definitely the show star here. For more flavor I also add garlic powder and cumin. You know I’m all about spices, so you can use optional: paprika, chili powder and for a bit cheesy flavor nutritional yeast. One word to kala namak: I bought mine ground so it looks like salt. If you can’t get it fine, please make to sure to use a mortar or grinder attachment from your food processor. You will need the texture fine like salt, roughly is not enough. 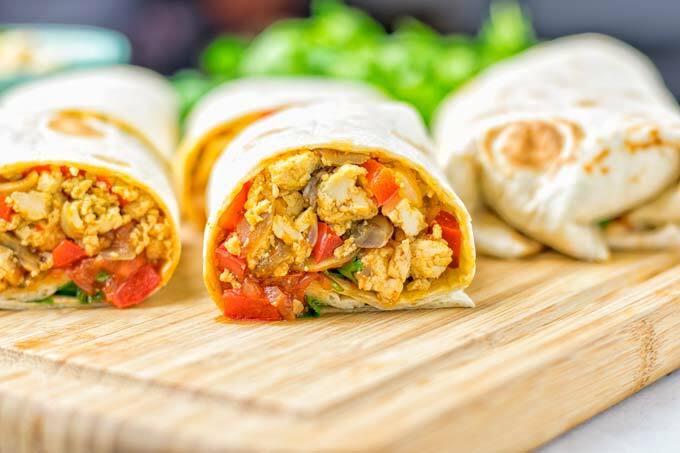 First you can see in the ingredients the used tofu is pressed and drained, which I recommend to do before you make this Breakfast Burrito. If you’re an experienced user, you know what I’m talking about. If not, no worries. The tutorial How to Press Tofu to Remove Moisture will help you to know how to prepare tofu in a super simple and easy way and it explains why tofu needs to be pressed. Now you’re ready to start: first heat a skillet with a bit of oil or with vegetable broth, if you don’t use any oil. Add onions, optional mushrooms and bell pepper, and fry all for around 4 minutes. Scramble the tofu with your hands and transfer to the pan, add kala namak and cumin. This is also the time for the optional spices such as paprika, chili, and for a more bold cheesy flavor nutritional yeast. Do you like tomatoes? Add some halved cherry tomatoes right now. Season all with a pinch of salt and pepper. 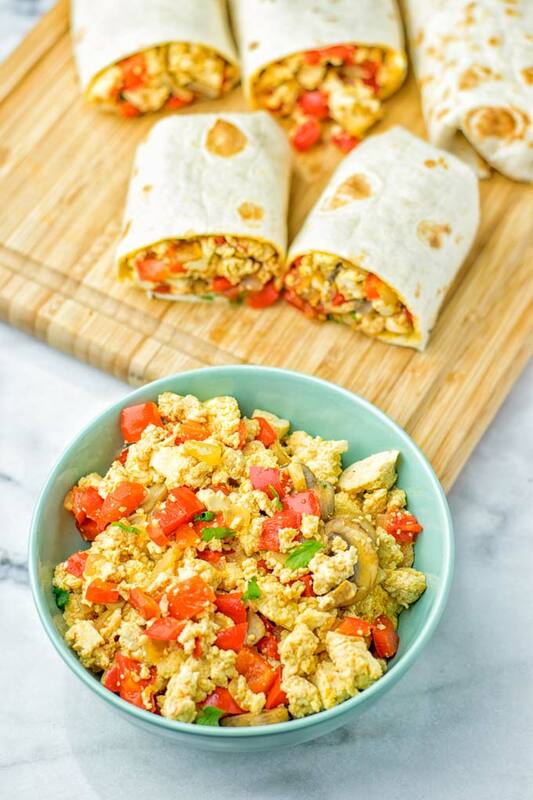 Be brave not to eat the tofu scramble before filling , it’s so addictive and amazing. Cook the mix for 4 minutes more. While doing this, warm your tortillas. Why should I warm tortillas? Because it makes them softer and less likely to break when folding the burritos. In the first version, you will need another skillet. Bring it to medium heat. Place the tortilla in it for 30 seconds, then flip. After another 30 seconds it should be warm ans slightly browned. Second method: place your tortilla on a plate that is large enough for your tortilla. Use the microwave on high setting for 20 seconds. No browning of the tortilla with this variant, of course. 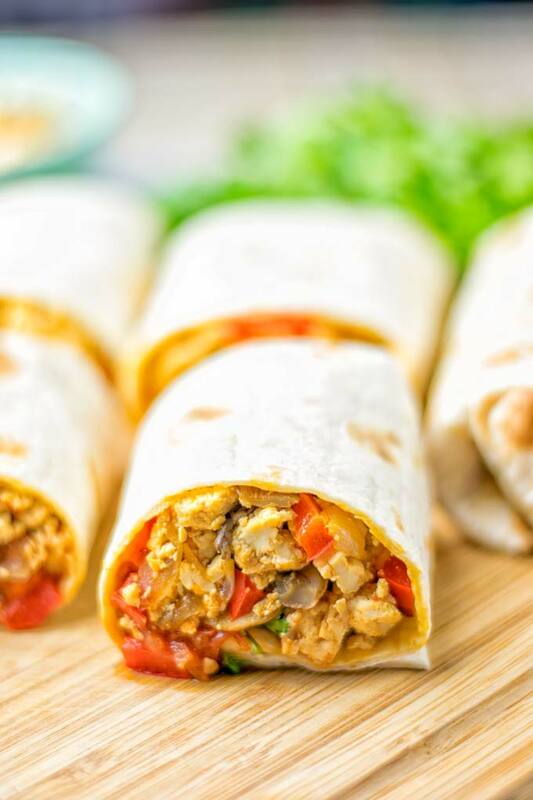 This Vegan Breakfast Burrito is also really great for lunch, dinner, meal prep, work lunch, or to make in advance. Not only for breakfast, we love all the savory things at any time. 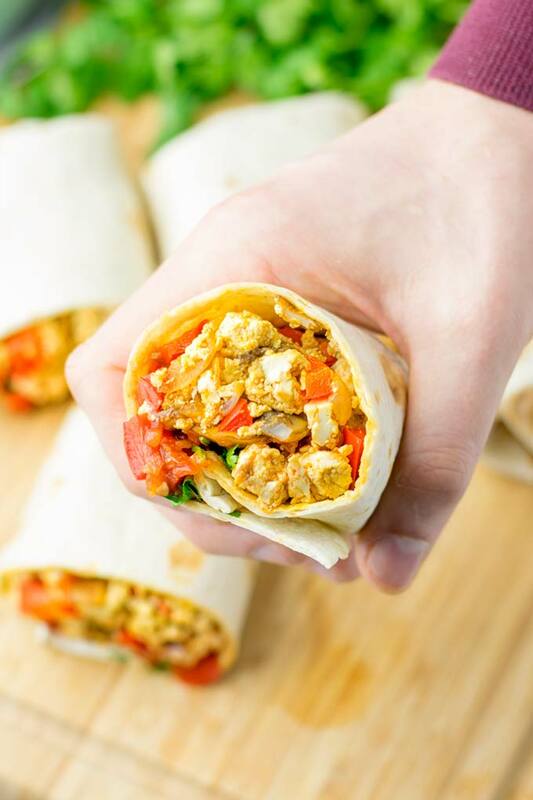 I haven’t tried it myself but I can imagine these freeze beautifully, if you want to plan to make freezer breakfast burritos. All that is possible, but I would skip the optional cherry tomatoes as these tend to get mushy when frozen and reheated. This will bring a different taste and texture result. Otherwise you can add or eat them fresh, if you like. 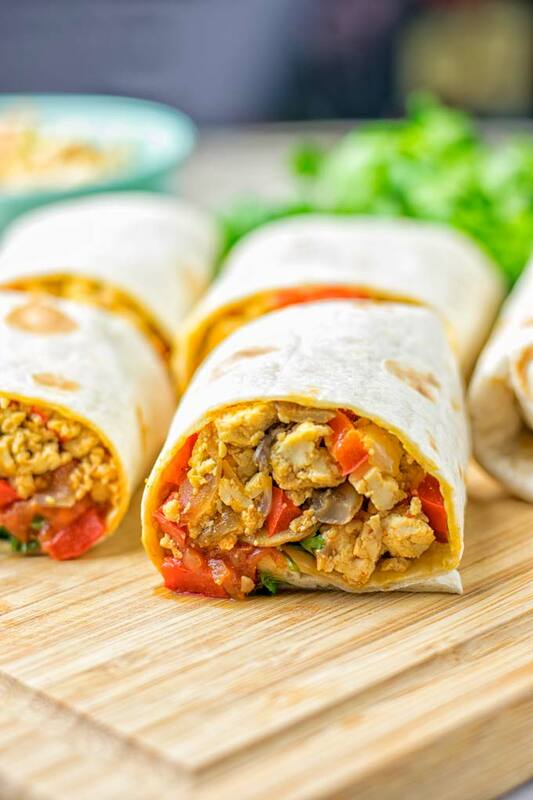 This Vegan Breakfast Burrito makes meal prep so easy and versatile to make everything for you simple as it gets: think about all the other great varieties. You can add black beans like the ones from my Mexican Fiesta Cauliflower Rice, corn, jalapenos and so much more to build from there. The best part is you never get tired or bored, and everything is ready whenever you need in no time. 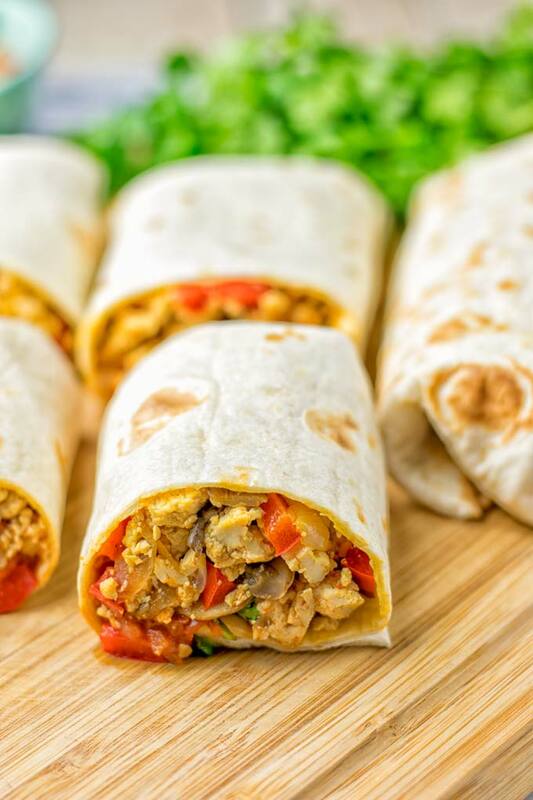 If you try this Vegan Breakfast Burrito, you know you will come back for it again and again. 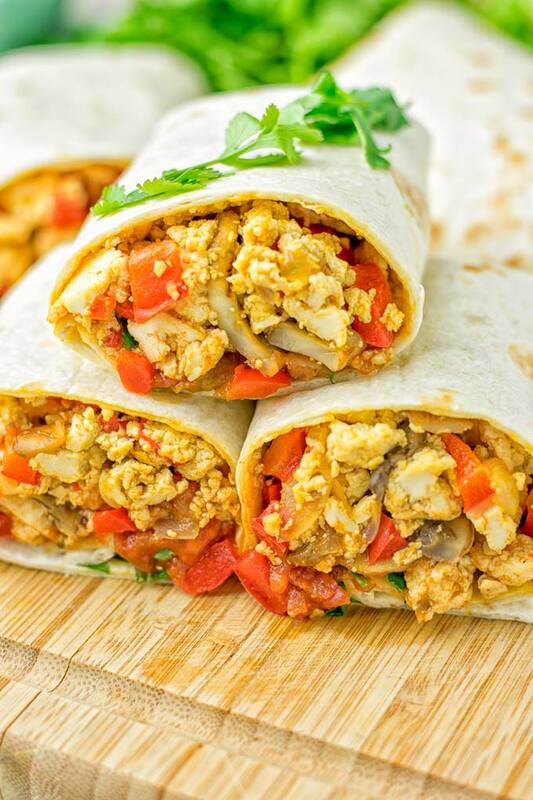 I know it’s seriously the best vegan breakfast burrito you’ve ever made. Show off on Instagram or Facebook. I love seeing all your remakes, Florian. Delicious! Thank you for this recipe! Great when on the way to work or on a casual picnic. Thanks for your amazing feedback, Yulian! I hope you’ll find lots of more recipes to try!